Good morning world, if it is morning where you are at. I have fed the puppies, so I could go back to sleep, but I thought I would irritate you all for a bit. I want to talk about a little heater. The Mr Heater Little Buddy propane radiant heater. This is a great little propane heater, unless it gets real cold. Even then it still tries, it just does not have the it umph to hear up the van when the temperature drop below freezing. Especially if there is any wind. That is more the vehicle than the heater. I imagine in a good shanty the Mr Heater Little Buddy works great. It certainly pots out enough heat, but our van is full of holes and has no insulation whatsoever. Now I I've had the Mr Heater Little Buddy for almost a year now. A real good friends of ours helped us get one last year when we were in Tennessee and it was snowing. I did not think it snowed in Tennessee, at least not that much. Anyway we got this Mr Heater Little Buddy propane radiant heater and it was absolutely perfect for that situation. Though I do wish it had a high and low setting. Yes they are times when it is too much, but without it, it is still a little chilly. Our sparker does not work anymore, but that is easily solved using a lighter. It burns pretty clean, and does keep back most of the chill. In a well built shanty on the ice, or in a nice tree blind I think the Mr Heater Little Buddy propane radiant heater would be in it's element. Pretty damn tough, and though it does go through some propane, about a bottle every three or four hours, it does the trick. When we get the RV though it will not be enough that is for sure. We also have the Mr Heater blue flame convection heater in the garage. This thing kicks out some heat. Even without the blower it takes the chill off the completely uninsulated garage. We have the 30,000btu model, and it is big, but it does stave off the cold. Once we get the garage insulated it will likely barely run at all. As it is we are burning through about 30lbs of propane per day. Not cheap, but once we get the insulation in it will be awesome and not cost that much. This heater the Mr Heater blue flame propane convection heater is a monster, far too big for our RV. I think the 10,000btu model will be ideal for the RV, but I will not know until I have tested it out. 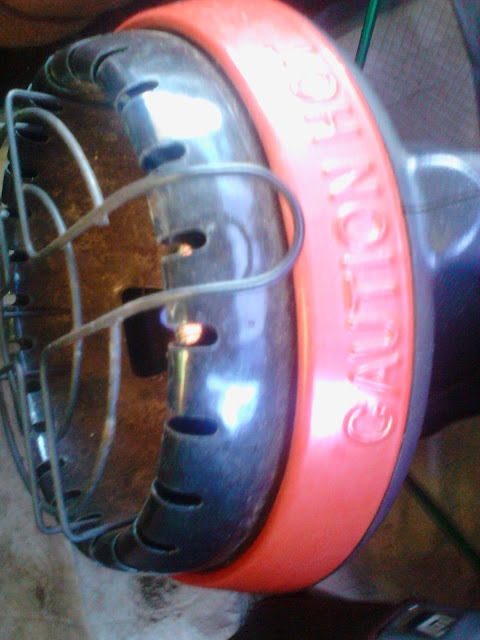 I almost never recommend a product until I have used it for a while, like the Mr Heater Little Buddy propane radiant heater, which I can tell you works, great, is durable, and in the right situation is the perfect tool for the job. I want to be honest here, the links are Amazon links I put here, and they are affiliate links, but Mr Heater company knows nothing of this post, and has not given me any incentive to write about their products. If you decide to use the Amazon links, cool we get a little bit of coin from it. I have to admit my social network is not extensive enough that even such endorsements would make much difference, but hey I appreciate it anyway. I have never earned enough to actually get any money from my affiliate links, but that doesn't matter to me, I do it because I believe in what I am endorsing. Well that is my disclaimer thing, and thank you for letting me bother you for a bit with this thing. I feel like this should be in a different blog, but I have all but ditched my other blogs, they just do not get any views. Not that this one gets much, if I post a lot I average about 20-30 views per post, sometimes the view count will get over fifty if I post a picture. The picture in this part of of our Little Buddy propane radiant heater in our van. Well I am done here, maybe I can pay again later, who knows. Well apparently Amazon took away my affiliate account, so no links, so yea, until that is fixed, all that stuff I said, forget I said it. After looking at my blog, three things stand out to me. One that I need to get an url, two that it needs a better template, and three, that I need to control the advertising links. If you want to support my work, and perhaps see more of it, you can donate to my cause by using my Amazon affiliate link, which I will begin publishing soon. I will also include a PayPal link, so you can subscribe to the blog. Other than that, click on the advertisements, comment, share, the usual stuff. Contact me if you would like to have me link to your blog or vlog, and I will check it out.